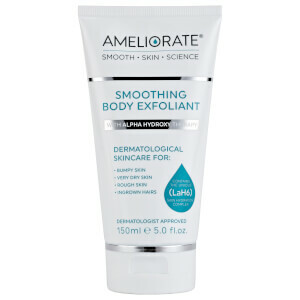 Instantly refine skin from tip to toe with the Exfoliating Body Mitt from AMELIORATE; a brand specialising in skincare for those experiencing Keratosis Pilaris, aka dry, bumpy ‘chicken skin’. Crafted from an innovative fabric weave that is gentler than a synthetic or natural loofah, the cleansing glove works to efficiently sweep away dead skin cells and unblock hair follicles, revealing softer, smoother, healthier-looking skin and enhancing the efficacy of subsequent treatments. Suitable for all skin types, especially those suffering from Keratosis Pilaris. Dermatologist approved. Use on dry skin before showering or bathing, using firm circular movements. Do not use on broken, infected, damaged or irritated skin. Not recommended for facial use. Care: Rinse regularly by hand or on a 30° cycle and dry naturally. Due to fabric wear we recommend replacing the mitt at least every 6 months for optimum efficiency.